YETI Ramblers will keep his coffee hot in the early morning and his drink cool in the afternoon. We have a variety of sizes available to fit any situation and a color to fit his unique style. Make sure to check out our new personalized ramblers specifically made for dad this Father’s Day. The more we move into summer, the more bugs start to spread. If you do not own a Thermacell Mosquito Repellent, make sure to check out the options we have available. The Repellent Camp Lantern is one of our favorites and the newest model available from Thermacell. This lantern is perfect for the backyard with its new durable, water-resistant body that provides bright light and repels mosquitoes. The heavy-duty rubberized base keeps it stable on the table and the battery life is up to 50 hours on the highest setting (300 lumens). These repellents shield a 15×15 foot area against mosquitoes and black flies with the use of a butane cartridge and special formulated mats. 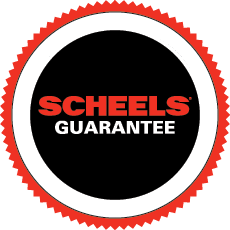 SCHEELS has an exclusive offer on the Traeger Texas Pro Grill that was created with all dads in mind. We bundled the Texas Pro grill with two meat probes, an insulated cover and a bottom shelf. Whether your dad loves to smoke brisket, grill burgers or make venison jerky, this pellet grill will be his new favorite toy on the patio. While the mosquitoes are away and the Traeger is billowing smoke, take some time to either relax in the Mac Anti Gravity Chair or have some fun with the family playing a game of bag toss. Bag toss is a fun game for the backyard, tailgating and camping. Space out the boards and challenge your dad to see who has the most accurate underhand toss! The Mac Anti Gravity Chair is durable enough for any camping trip, but also stylish enough to look good on your patio. This chair has multiple locking positions for ultimate comfort and pairs great with a cold beverage in a new custom YETI!